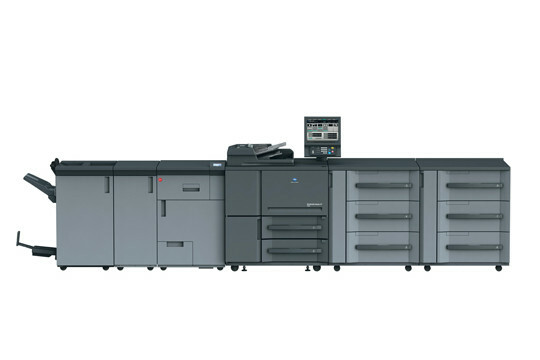 Announced at Drupa by Konica Minolta, the bizhub PRO 1052, bizhub PRESS 1052, bizhub PRESS 1250 and bizhub PRESS 1250P have arrived and are available in North America and in Europe. Based on the same print engine, these machines differ in speed (105 and 125 A4 pages per minute respectively) and in the configuration options. The PRESS machines have more paper supply options and a wider selection of finishing options than the PRO 1052. Among the improvements on these new machines which the brand are highlighting we see improved handling for high paper weights in duplex mode. These new machines can print on both sides of 300 gsm stocks, and onto 350 gsm in simplex mode as hitherto. Several new features introduced in the bizhub PRO 951 launched earlier this year appear in the new machines. The intelligent media catalogue allows operators to select from a list of frequently-used stocks, and the extended range of quality management tools includes tone curve adjustments and a new screening utility. These machines will be on Your DMO in the coming days!